Many slips and falls are relatively minor, causing nothing more than a little scrape or two and some feelings of embarrassment. Other times, slip and fall accidents can result in serious injuries, including broken bones, brain or spinal trauma, and even internal bleeding. Serious slip and fall accidents can be costly, leaving victims unable to work and buried under a mountain of medical debt. However, if the accident occurred on another person's property due to the owner's negligence, victims can often seek compensation for their injuries. While filing an accident report isn't a strict legal necessity, carefully documenting your injuries and the accident scene, as well as obtaining the representation of an experienced personal injury attorney, can help strengthen a premises liability case. When a slip and fall accident happens on a commercial property such as in a grocery store, it's often company policy for the business to complete an accident report that includes an account of what happened. This report usually gives a description of the scene and provides the names and contact information of any witnesses. While completing this report can help strengthen your claim, it's important not to sign anything before consulting an attorney. In cases where the accident results in serious injury, it may also be necessary to file an accident report with law enforcement. 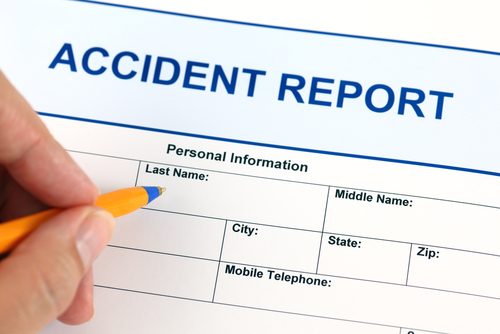 Whether filing an accident report with the business where the accident occurred or with the authorities, make sure to request a copy of the report for your own records. If your injuries are serious enough to require medical attention, it's important to ensure that your medical records are consistent with the accident reports. When the doctor asks what caused your injuries, make sure to tell them exactly what you told the business owner or law enforcement officer. Having your injuries and account of the accident carefully documented by medical professionals can lend further credence to your claim. It's also important to save any and all medical bills related to your injuries and treatment. Whether the slip and fall accident happened on commercial or private property, it’s also helpful to document the incident by taking multiple photos of the scene, as well as your injuries. If you or a loved one sustained serious injuries in a slip and fall accident that happened on commercial, private, or public property, the resulting medical debt can leave you feeling stressed and unsure of your future. Pursing compensation for medical bills related to your accident, lost wages or loss of earning potential, and the resulting pain and suffering can give you the financial support that you need to move forward. However, just because you were injured on another person's property doesn't necessarily mean that you’ll receive a financial reward. Premises liability law is complex and requires the plaintiff to meet specific criteria for the burden of proof. Thus, having the representation of a skilled and experienced personal injury attorney is essential to securing a successful outcome in a slip and fall case. For a free, no-obligation evaluation of your premises liability case, contact the knowledgeable legal team at the Inland Empire Law Group. Our law offices in Victorville and Rancho Cucamonga are standing by to take your call.